FORT WORTH, Texas – Motorsports royalty will spend Tuesday hot-lapping around Texas Motor Speedway. Fernando Alonso will drive an Indy car on an oval for the first time since his Indianapolis 500 debut in May 2017 during a closed test at TMS in preparation for the 103rd running of “The Greatest Spectacle in Racing” next month. Alonso’s test around TMS’ high-banked/1.5-mile oval will be in a sister car to the No. 66 Chevrolet-powered chassis entered by McLaren Racing. The car’s livery was unveiled Monday. Built at McLaren Technology Centre in Woking, United Kingdom, Alonso’s No. 66 is panted McLaren papaya orange, the color chosen by organization founder Bruce McLaren of New Zealand for the team’s first F1 entry in 1966. The car also reflects the livery of McLaren F1’s current MCL34. This year’s scheme for both racing series features a complementary blue swatch that is a nod to the team’s racing heritage. Additionally, the No. 66 honors McLaren’s first victory at “The Brickyard” in 1972 with American Mark Donohue in the Sunoco McLaren M16/Offenhauser fielded by Roger Penske. The No. 66 car is en route from the United Kingdom to the USA ahead of an open test around the 2.5-mile Indianapolis Motor Speedway scheduled for April 24. The 2019 NTT IndyCar Series schedule does not include an oval-track race prior to the Indy 500. The Formula One World Driving Champion in 2005 and 2006, Alonso will be looking to secure the final leg of motorsports’ Triple Crown with a victory at IMS on May 26. The Spaniard won F1’s “Crown Jewel” street race _ the Monaco Grand Prix _ in 2006 and 2007 driving for Renault and McLaren, respectively. Alonso added a victory in the 24 Hours of Le Mans in his debut in the French sports car endurance classic in June 2018 driving a Toyota hybrid along with Kazuki Nakajima of Japan and Sebastien Buemi of Switzerland. Toyota scored its first Le Mans victory in its 20th attempt, as well as the first win for a Japanese manufacturer since Mazda’s victory in 1991. With his shared victory at Le Mans, Alonso became one of only 13 drivers to have won two of three legs of the Triple Crown. Two-time F1 World Champion Graham Hill of Great Britain is the only driver to have won at Monaco, Le Mans and Indianapolis. 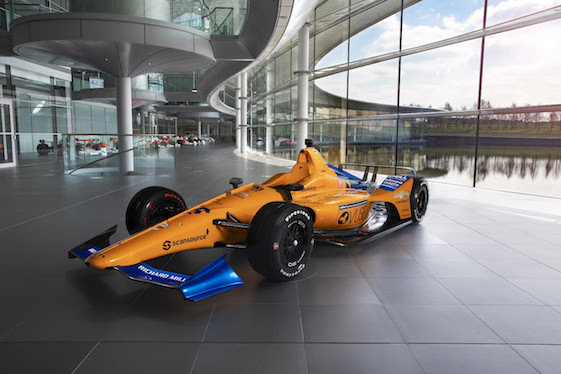 McLaren announced its collaboration with Alonso and Chevrolet and its 2.2-liter twin turbocharged direct injected V6 IndyCar engine program in December. In 1966 Chevrolet and McLaren partnered in the Can-Am Series, where those teams won over 70 percent of the races over the next seven years _ including 23 in a row from 1968-1970. Alonso made his IndyCar Series debut at IMS in May 2017 in collaboration with McLaren-Andretti Autosport. 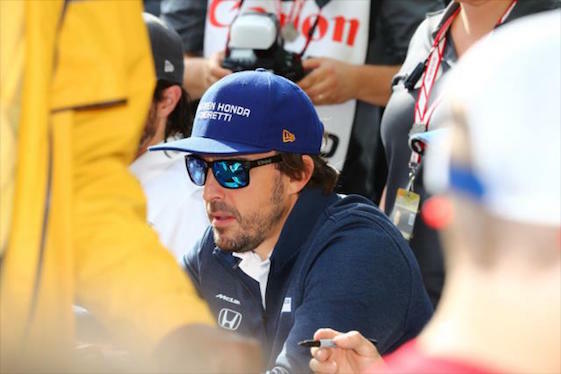 Alonso _ who was allowed by Brown to skip the Monaco GP to compete at Indy _ qualified his No. 29 Honda-powered entry fifth and led 27 laps before an engine failure on Lap 180 of the scheduled 200 relegated him to a 24th-place finish in the 33-car field. Alonso was running seventh when sidelined by that mechanical failure in a race won by Takuma Sato of Japan. Nevertheless, Alonso won Rookie of the Year honors and earned a payday of $305,805 for team-owner Michael Andretti. Alonso will be joined during the TMS test by three-time Indy 500 champion and McLaren Racing Team Ambassador Johnny Rutherford of Fort Worth. “Lone Star J.R.” competed at IMS in McLaren cars from 1973-79, a run highlighted by victories in Offy-powered entries in 1974 and 1976 sandwiched around a runnerup result in 1975.